My son had some friends over for a play-date on the weekend and after they'd had their fill of trampolining, playing in the sand-pit, racing in the go-cart and building towers, and after we'd put little sister down for a sleep, we sat down for a quiet bit of Christmas crafting (it's always much quieter without little sister, and to be honest, quite a bit more enjoyable!). 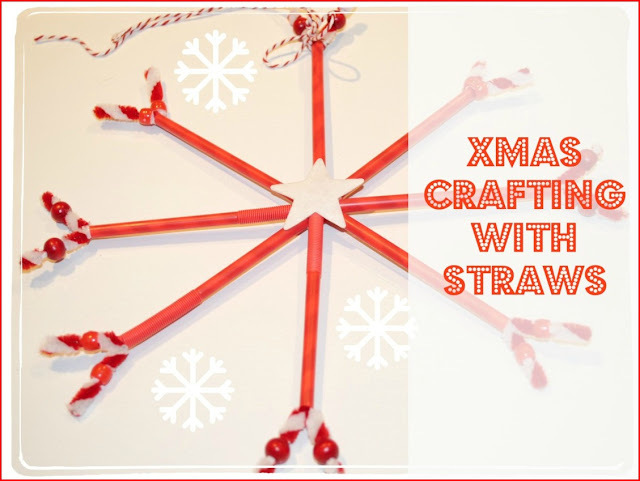 I had a big packet of straws left over from my work Xmas function so we decided to make some little straw Xmas decorations with them. All we needed, other than the straws, were some pipe cleaners, some beads and a decorative something for the centre. Voila! A very kid-friendly, non-messy, easy Xmas craft project. Both 5 year olds and the 9 year old really enjoyed making these, did a lovely job and could manage all but the twisting bit by themselves ... which always makes Mummy happy, especially when she's got a great coffee on the go! The kids did great. The stars and cards look fantastic. What a sweet little craft project, you're very creative. Have a wonderful Christmas, Nikki!